Miss Happ Rockabilly and Pin Up Clothing: Miss Happ facebook page reaches over 1900 Fans! Miss Happ facebook page reaches over 1900 Fans! Friday we reached an exciting Miss Happ milestone! We just reach 1940 Facebook fans on the official Miss Happ page! 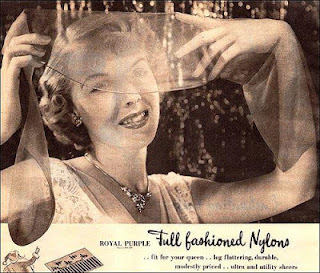 And besides, it's a super cool date too; Did you know that the year 1940 was when the 1st NYLON STOCKINGS were introduced to the general public. It's been reported that "Women lined up at stores across the country to obtain the precious goods!" I think that was a pretty cool year!! Thanks & a big welcome to all our newbies! Please LIKE & SHARE our facebook page to share the Miss Happ love!